This week I’ve been busy traveling around the UK to tell people all about Wind Empowerment. I spent 4 days in Exeter at the annual gathering of the Royal Geographical Society (RGS), which attracts a global audience of over 1,000 people. The WISIONs programme at the Wuppertal Institute supports not only Wind Empowerment, but also two other practitioners networks, RedBioLAC and HPNet. In partnership with Carmen Dienst, we presented these networks as a means of empowering rural communities in less developed countries by linking together the various “knowledge hotspots” that have emerged around the world using online platforms such as WindEmpowerment.org and exchange activities. The Measurement WG DevWeek that took place in Toulouse this April was given as an example of such an exchange activity, where network members with specific skills are brought together to share them with other network members in a practical workshop environment. A few days later, Carmen and I chaired a session on delivery models for sustainable energy access in less developed countries. WE trustee, Heather Cruickshank, shared her latest thinking on the topic, having supervised Annabel Yadoo’s groundbreaking PhD work that opened up this field of research. 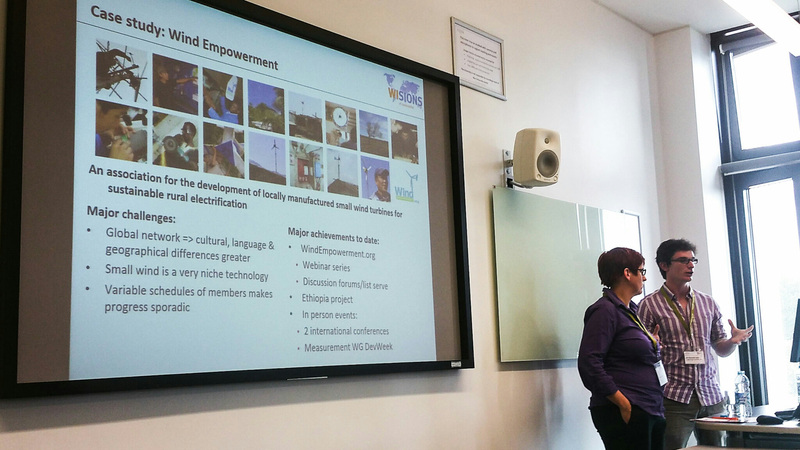 Zoe Ben also presented her Master’s research on the comparative analysis of a diverse range of models used by WE members to deliver energy access with small wind turbines in their local area. On Saturday, I travelled to the Centre for Alternative Technologies in Wales to attend Practical Action’s Small is Beautiful Festival. The event aims to provide a forum for debate and practical skill sharing on the theme of appropriate technology. Aran Eales represented both Wind Empowerment and V3 Power, facilitating two practical wind turbine sessions designed to introduce participants to the basic concepts behind the operation of small wind turbines and, of course, the local manufacturing process. Together we also ran an hour long session presenting the application of small wind turbines in remote areas of less developed countries and the role that Wind Empowerment plays in facilitating this process. We are currently running an Indiegogo crowd sourcing campaign as Wind Empowerment is a non-profit organisation. So even if you are unable to make it to the conference personally, we would very much appreciate your support to make sure all those that want to attend the event and take the knowledge back to their own countries can do so. This week I’ve travelled from Punta Arenas in the very Southern tip of Chile, up to Comodoro Rivadavia in Argentina. I never thought I would be so pleased to see something as simple as tree, but after spending many days driving through the empty desert that covers most of Southern Patagonia, arriving in Comodoro Rivadavia and seeing a big palm tree as I stepped out of the bus station was certainly a sight for sore eyes! The first stop on my trip was CERE-UMAG: The Centre for Energy Resource Studies at the University of Magallanas. I was pleased to hear from the centre’s director, Humberto Vidal, that the provincial government has recently published its first formal energy policy and that CERE-UMAG has been asked to undertake a detailed evaluation of the energy resources available in the region. Oil and gas is relatively cheap, as there is a lot of production in the region, meaning that renewables have played a relatively small role in the electrification of the region. Fortunately, this looks set to change, as the provincial government have published their first energy policy and have commissioned Humberto Vidal and his team at CERE-UMAG to carry out a detailed feasibility study of energy demand across the region and the resources that are available to meet it. This will then be used to open a public tender for local companies to provide solutions on the ground that match CERE-UMAG’s recommendations. Shortly after crossing the Argentine border, we arrive at Rio Gallegos, the provincial capital of Santa Cruz. Although the city’s economy is driven primarily by oil, I am here to see one of Argentina’s foremost experts on renewable energy, Rafael Oliva (although his modesty will prevent him from admitting it!). Rafael was already teaching about renewable energy at the National University of Southern Patagonia (UNPA) before I even started studying, so it was an honour to be invited to share the experiences from my research on small wind for rural electrification with his colleagues, the students of his renewable energy course and even some younger students from a local science club. Unfortunately, the future is not so bright for small wind in Santa Cruz, as although it is probably the windiest province in the entire country (small wind sites with 8m/s annual mean wind speed at 10m are the norm), difficulties with maintaining the 1,500 SWTs installed in neighbouring Chubut have steered the local rural electrification strategy towards a solar only solution. Next on my trip was a surprise visit to another of San Julian’s campuses, this time in San Julian. Despite the last minute addition to the itinerary, the event was remarkably well promoted, with posters up around town and an announcement put out on the local radio. As a result, a mixture of academics, students and the general public all turned up to hear me talk about my experiences with small wind in other countries. The next day we went to install a datalogger at a newly comissioned test site in San Julian. The system has been designed to take power curve measurements according to the international standards, IEC-61400-12. The entire system was designed and built by Rafael Oliva himself, who has also built the dataloggers used by the National Institute of Industrial Technology (INTI) at their small wind test site in Neuquén that is usedfor the national small wind certification programme. Unfortunately we couldn’t finish the install as the day before, Rafael burned out one of the circuit boards as we were testing the set up – good to know that it still even happens to the experts, as I was beginning to think that there was no hope for me given the amount of components I’ve set on fire during the last few years! Download the full presentation from UNPA Rio Gallegos and San Julian in PPT or PDF. After over three years working on the project, it was a great feeling to finally launch the first editions of Engineering in Development at EWB’s Massive Small Change conference today. Both the Pre-departure and Transport books were available in proper printed book form and were selling like hot cakes. The original print run of 20 Pre-departure books has now completely sold out, with almost all the books given to this years outgoing EWB-UK placement volunteers, who attended EWB’s Pre-departure Course earlier this month. 8 of the Transport volume were sold today and whilst the Energy volume was only available to demonstrate in pre-print form, we were really impressed with the amount of people who were already wanting to get hold of it. Not only were people interested in reading it, but also in contributing to it, as these are just the first (of hopefully many) editions of the ongoing Engineering in Development process, which is designed to capture and disseminate the huge range of knowledge that EWB-UK has acquired during the last 12 years. Both the Transport and Pre-departure books are now available to download for free in pdf format on the Engineering in Development web site and it is hoped that the Energy book will be joining them in the next couple of months. Last Wednesday I had the privilege of sharing my work with a multidisciplinary audience as part of the Climate Histories seminar series hosted by CRASSH (Centre for Research in the Arts, Social Sciences and Humanities) at the University of Cambridge. The audience included social anthropologists, civil engineers, people working in policy and everything in between. I was given the mammoth task of summarising my entire PhD thesis into a 45 minute presentation. Not easy when you consider that the original thesis was 110,000 words. However condensing it down into something more digestible was inevitable if the knowledge it contains was ever going to make it beyond my supervisors’ bookshelves. It really was a pleasure to be able to share my work with such an engaging audience – I’m sure I learned more than they did from the experience, as the questions they asked and the debate that ensued took the research in new directions that I never would have imagined with my blinkered engineer’s brain! Listen to the full audio recording and download the accompanying powerpoint. 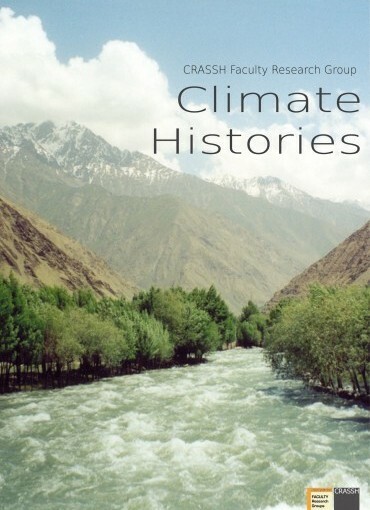 Listen to the other talks or find out more about the CRASSH Climate Histories Seminar Series. Particularly recommended is Richard Fraser’s account of the the impact that large scale wind power in Inner Mongolia has had on both traditional and modern ways of living. Calling all Londoners: this Thursday, the film made by Chris and Chris of Imperial College about electricity in Nepal will be premiering in London. I was lucky enough to tag along with them in November 2012 when they filmed it, so really excited to see the final product. We are very pleased to announce the premiere of the documentary film: Powering the Top of the World which we filmed over the course of our trip to Nepal in the summer of 2012. We’d like to take this opportunity to thank all who helped make this film possible and to invite you to the upcoming premiere. This will be followed by a Q & A and drinks reception. Tickets are free but please register here to secure you place. For those unable to make it to London, the film will be released online for you to view shortly afterwards. Further details will follow. Nepal resides in a unique situation, trapped between two countries which are rapidly becoming the world’s largest energy consumers; it has vast clean energy resources, but as yet has had little success in harnessing enough energy to satisfy even its own modest domestic needs. Powering the Top of the World examines the transition of the country’s energy system and explores the challenges that this developing nation is facing in the current global geopolitical environment. With 1.2 billion people around the world having no access to electricity, and many more with an unreliable supply, Nepal’s challenges are echoed throughout the world. Through interviews with those in charge as well as the people whose daily lives are impacted, this film asks the question: what is Nepal’s energy future?